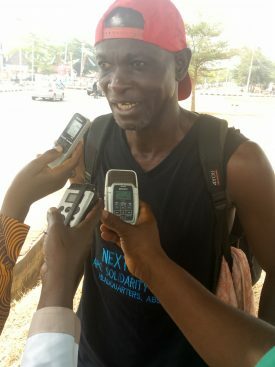 According to a Daily Trust report, Malam Sani Ahmed, a member of All Progressive Congress (APC) Solidarity Group today, trekked into Minna, Niger state capital in solidarity with President Muhammed Buhari. Malam Sani arrived the Minna City gate at about 10am after a sleepover at Pogo Nigeria National Petroleum Corporation (NNPC) depot. He had slept over in Lambata Pogo in the course of the journey before entering Minna today. Speaking with journalists in Minna, "This is to show that APC Solidarity Group identified with their performances and having emerged victorious at the just-concluded polls, we want to encourage them to do more." Don't you tired of trekking?